This Genoa car dealership has been exceeding expectations since changing leadership in 2013. Meet the new owner, Phil Harris, and his family-oriented team. 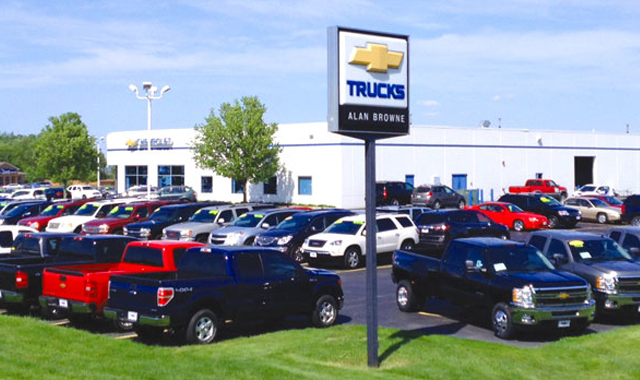 Alan Browne Chevrolet, in Genoa, has more than quadrupled its staff and tripled its annual car sales since 2012. Owner Phil Harris attributes his success to emulating Alan Browne’s management style. Phil Harris was 19 years old when his fascination for cars turned into more than just a hobby. He began his career as a salesperson at Jack Wolf, in Belvidere, and worked his way up to becoming a partner at their Chrysler-Jeep store. He also was the general manager at Bachrodt on State, for five years, before starting an online marketing company. Almost 20 years later, Harris received an enticing offer in 2013 to buy out Alan Browne Chevrolet, 700 Pearson Dr., Genoa, a Chevy dealership selling both new and used vehicles. Harris completed his purchase of Alan Browne Chevrolet in October 2015, and results speak for themselves. In 2012, the company had 12 employees; today there are more than 50. Annual sales were at about 300 cars; now the dealership sells just under 1,000 vehicles per year. Harris emulates Browne’s management style; nothing is more important to him than customer satisfaction and a high quality of life for employees, he says. While some dealerships have a competitive nature, Harris is more concerned with meeting a customer’s needs well. It’s common to see a salesman washing a car to be helpful to the service department, or a serviceman pulling a car up to the front to help the sales team. Staff turnover at Alan Browne Chevrolet is extremely low, says Harris, and many employees were themselves previous customers. The team’s overall job satisfaction ultimately leads to customer satisfaction, Harris says. Beyond a friendly greeting at the door, a customer at Alan Browne Chevrolet can expect to be treated with respect, whether an experienced vehicle owner or a teenager buying their first car. As a father of a 16-year-old, Harris knows it’s extremely important to treat every customer as he’d want his daughter, Bridget, to be treated. With more than 300 vehicles on site in a $10,000,000 inventory, customers can expect to find a wide selection of products at Alan Browne Chevrolet and Harris and his team take their time when assisting customers. All new cars at Alan Browne Chevrolet are Chevys, of course, but used vehicles can be anything and range from $1,000 to $60,000, Escorts to Escalades. The wide selection draws customers from Genoa, Kingston, Rockford, Belvidere, DeKalb, Sycamore and even from cities out of state. Chevy trucks are an especially hot commodity, so Harris makes sure that more than 50 are available at any given time. Since the dealership has a lower overhead than many of its competitors, it often sells vehicles at a lower price. Harris makes sure to promote this information – branding the company “Chevys4Less” for its “right price” combined with a wide selection. Harris is anticipating double-digit growth this year. He’s added staff members to his team, in addition to a commercial department and a business development center. The service and parts department has been an especially important component in Alan Browne Chevrolet’s overall growth. Having positive people conduct efficient on-site repair work has greatly bolstered the company’s credibility. Harris believes that the staff’s efficiency and positive nature leads to the best marketing available: word of mouth. Alan Browne Chevrolet receives much repeat and referral business, Harris says, all due to previous customers rallying for the company’s success. Harris feels that the community is largely responsible for the growth that Alan Browne Chevrolet has experienced. “The biggest thing is definitely our community members – they will continue to support us as long as we continue to support them, and that’s the easiest way to grow your business,” Harris says. Sponsoring community groups and organizing an annual toy drive for local charities has positively impacted the company’s brand. Good relationships with local banks have allowed customers to get better interest rates and terms on their loans. Harris looks forward to continuing the legacy Alan Browne has demonstrated for more than 40 years: treating family, community, employees and customers with the respect they deserve. Browne has shared this one important message with Harris: treat everyone better than you’d want to be treated. This entry was posted on Wednesday, March 2nd, 2016 at 11:55 am	and is filed under Northwest Business Magazine. You can follow any responses to this entry through the RSS 2.0 feed. Both comments and pings are currently closed.